Having outdoor solar lights comes with a plethora of advantages for both you and the environment. Before you jump on board and buy multiple strands, you need to learn about the brands so you can buy the best solar powered Christmas lights for you. Each comes with their own advantages and disadvantages, so it takes a while to figure out which works best for you. Thankfully for you, we have compiled multiple reviews here at Green and Growing to help you in your research. We have a list of the best solar Christmas string lights on the market today, so all the reading you need to do is right here. This review will discuss the advantages and disadvantages of the VERKB solar Christmas string lights. The VERKB solar Christmas string lights are very similar to several of the other solar string lights we have reviewed here at Green and Growing. It even has similar reviews on Amazon. This product has a rating of 3.6 stars, so they are pretty good but customers have had problems with them as well. These light strands have a dark cord and cylindrical LED light bulbs. One main difference from VERKB and the other brands we have reviewed is the color. The other strands came in either white or multicolored bulbs, but this one comes in blue. This will be great for those who want outdoor solar lights for their decorating but do not want the lights to be too bright. The blue will also give an ethereal, icy look to your yard. Let’s take a closer look at them to find out more information. The VERKB solar powered Christmas lights use LED light bulbs, which is a major win. LED lights are much more energy-efficient than incandescent bulbs (the light bulbs on ordinary string lights). The average American spends more money on their electric bill during the holidays just so they can run their Christmas lights. Incandescent bulbs need hundreds of watts to operate, meaning they need more energy. This costs you more money if you are using electric lights. On the other hand, LED light bulbs need much less to operate. For a light strand with 200 bulbs like the VERKB lights, it probably needs less than 20 watts to operate. This uses much less energy, which saves you money on your electric bill. Here is the thing though: these are solar Christmas lights! This means that it will not affect your electric bill at all to run these lights. Think of the savings you will have during the holidays. All it costs to run these solar lights is the cost of the lights itself. After that, you do not have to worry about putting more money into it. The single crystal silicon solar panel on the VERKB solar Christmas string lights may seem small, but it also has a high conversion rate. On top of that, the LED light bulbs do not need much energy anyway, so the solar panel does not need to work too hard to create the energy needed. Another great attribute of these solar Christmas string lights is the fact that they are waterproof. For many people, Christmas consists of snow, rain, and wind, and this can ruin some Christmas decorations. Thankfully, you do not need to worry about these lights quitting on you after a snowfall. In fact, VERKB claims that every part of the strand is waterproof and can work just fine after getting soaked. It is important to keep in mind that this kind of weather may still negatively affect the performance of the lights. This is purely because storms decrease the amount of sunlight the solar panel has access to, so the lights may not stay on all night after a storm. Depending on how long the storm lasted, they may not come on at all. Do not worry if this happens. These solar powered string lights also make your life easier by turning on automatically at night. This is because the solar panel has a sensor inside of it. When it detects darkness, the lights stop charging and turn on. Similarly, when the sensor detects sunlight, it will turn off the lights and start charging again. This makes it really easy for you since you will not have to go out every morning and night to take care of the lights. The holidays can be stressful, and your solar lights should not contribute to the stress. The VERKB solar Christmas string lights come in a strand that is 72 feet long and contains 200 blue LED light bulbs. There is a section of the strand by the solar panel that does not have any light bulbs so you have enough length to place the panel in direct sunlight. When you buy this light strand, it also comes with a ground stake for the solar panel and an instruction manual. This is all you need to run the lights and decorate your home for the holidays. Before using these solar string lights, VERKB recommends charging them fully. This means that you will need to use the switch behind the panel to turn them on and let the panel have six hours of direct sunlight. With six hours of charging, the lights will stay on at night for eight hours. These solar lights also come with eight different light modes. These modes include steady on, twinkling, slowly fading, chasing, waving, fading, fireflies, and combination. These options help you to create the exact look you want to have for the holidays. You can even change up the options just to add some variety because you do not have to use the same one all the time! There are so many creative ways to place solar string lights, and the different lighting options mean that there are countless ways you can use the lights. Let your creative juices flow and start decorating! We do not have information about VERKB as a company because they do not have a website that explains their vision and goals. All that we know is that they create some of the best solar Christmas string lights on the market today, which is amazing! Some people may not think it is important to use solar string lights, saying it does not do much for the environment. We would have to politely disagree. We stated earlier that traditional electric string lights require more energy to operate, which is manifested in higher electric bills. By reducing the amount of energy you use during the holidays, you are helping the environment. This is especially true if your area uses fossil fuels to generate electricity. Solar energy is free and does not harm the environment, so solar lights are important. Customers seem to really love these lights, and some of their reviews are better than what VERKB advertises. They do not need a ton of sunlight to keep them on all night long. Even on cloudy or stormy days, these lights still perform to the customers’ expectations. It definitely helps that these lights are waterproof because they can weather the storms like a champ. The solar panel also has a high conversion rate, which means that it does not need as much sunlight to produce a large amount of energy. These solar Christmas string lights also use LED light bulbs. These lights are energy-efficient, so they do not need much to operate. 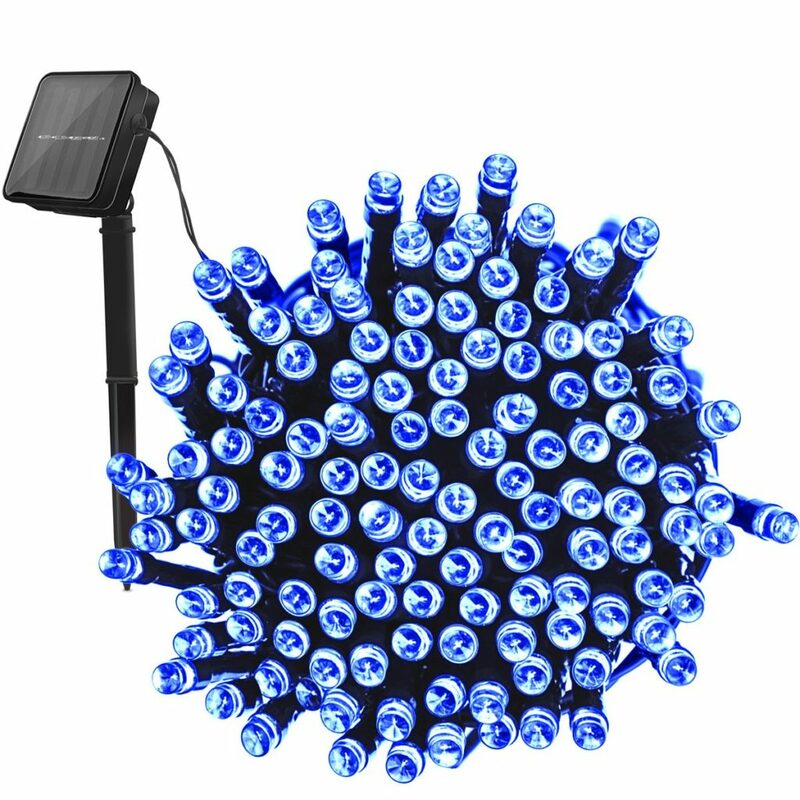 This paired with the high conversion solar panel makes a great strand of lights that work all night long. LED light bulbs are also much safer than incandescent lights because they do not heat up. Fires caused by Christmas decorations cause millions of dollars in damage every year, and no one wants to deal with that during the holidays. By switching to LED string lights, you make your home much safer. The negative reviews about the VERKB solar powered Christmas lights seem to imply that some customers have unrealistic expectations for the product. One dissatisfied customer even stated that the lights only work if the sun is directly out, ignoring the fact that these lights work best if they have access to direct sunlight during most of the daylight hours. Other customers state that the lights are fragile, so make sure you are careful with them as you hang them up or wrap them around objects. From what customers have stated, it really seems that the VERKB solar Christmas string lights should have a higher rating than what they currently have. These lights perform well with less daylight than some other solar string light brands. They have great qualities, including being waterproof, using LED lights, and turning on automatically. These lights definitely make our list of the best solar powered Christmas lights on the market today. If you want to try a strand for yourself, you can purchase it on Amazon for $23.90. To find the best solar powered string lights, take a look at each of our reviews here at Green and Growing. We have reviewed several different brands of solar lights and are confident you will find one that works best for you. Using solar energy comes with great benefits for the environment, and they also save you money in the long run. Here are some top questions that I found for people seriously considering buying the VERKB 200 LED Solar Christmas String Lights. How long should I charge the VERKB solar Christmas string lights? For optimal performance, these lights need at least six hours of sunlight every day. This should keep them running for at least eight hours at night. Do I need to bring the lights inside if it rains? These lights are waterproof, so you can leave them out in the rain and they will work just fine.